This is another one of those cars that you just don't see often in the US. The Sports 6 was marketed by Triumph in the US as a "limited-edition" car. I doubt they wanted it to be a "limited" as it turned out to be, though. Introduced in 1963, fewer than 700 of these cars found homes in the US before Triumph withdrew it from the market in 1964. Based on the Triumph Herald, the Sports 6 had a restyled nose and some different body trim. While the 1.6 liter inline 6 cylinder engine was no rocket, it made the car quicker than the 4 cylinder Herald. Triumph Herald's rusted horribly, but this Sports 6 has spent its entire life in California and shows little corrosion other than some surface rust. It would still be worthwhile checking the car thoroughly for hidden rust. 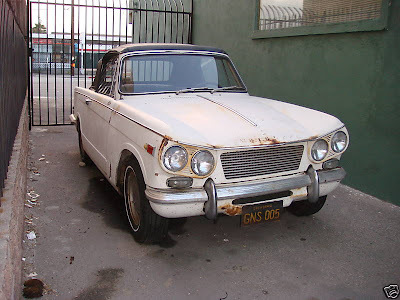 This car needs restoration, but according to the seller it runs and drives. You could start to work on it now and have a nice show car by late summer. Or you could make it a rolling restoration project and have fun with it right away. The Sports 6 shares a lot of parts with other Triumph models (the Herald, obviously), so getting parts for a car that sold in such small numbers in the US is not as big of a problem as it is for other "limited edition" cars. Parts that are not available in the US can usually be found in the UK, where the car still has a large following. (In the UK, this car is known as the Triumph Vitesse). The North American Triumph Sports 6 (Vitesse 6)and Triumph Herald Database should be able to help you with parts and information about this car. You are correct about the suspension. I should have pointed that out. Thanks for the trivia about the names. I love that type of stuff! My husband and I just purchased a twin to this vehicle. We bought it on instinct then found out how rare it is unfortunately I cannot find how to price it for auction I would appreciate any information you can provide about pricing this car. I own a Dec-1962, sold in 1965, Triumph Sports 6; I am restoring mine in Northern California - Lake County.